This Healthy Chocolate Cake has just TWO ingredients and is deliciously moist, chocolatey, and downright decadent! Grease and flour cake pan (to flour, use a dash of cake mix, sprinkling it inside the pan and tipping it around to evenly coat). Beat cake ingredients together, about 2 minutes, then pour into greased and floured pan. Bake according to instructions on box of cake mix. Mix in powdered sugar and vanilla, then gently fold in whipped topping. Allow to set about 15 minutes in refrigerator. Store cake covered in refrigerator. 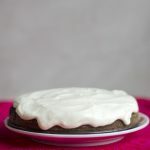 Recipe from Live Eat Learn at https://www.liveeatlearn.com/dads-healthy-chocolate-cake/.